Considered by many as the king of the sea, swordfish has been the star of recipes all over the world for centuries thanks to its tasty and nutrient-dense flesh. The legend goes that it made its appearance in the seas by the will of the Goddess Tethis: after Achilles’ death, the Myrmidon warriors, who were master lancers, hurled themselves into the sea in grief and the goddess turned them into swordfish. Its distinctive feature is obviously its “sword”, which is none else that the extension of its upper jawbone; measuring almost 1/3 of the fish’s length, it has sharp edges and is used as a weapon for defence, as well as a tool to hunt food. Swordfish can reach 4.5 m in length and weigh up to 500 Kg, even though the maximum length measured in our seas is 3 m (excluding the bill) and 350 Kg in weight. On average, caught specimens range from 120 to 180 cm in length. As we mentioned, swordfish is much appreciated for the quality of its white-to-pinkish, whorled patterned flesh. It is rich in proteins and poor in fats; it has the same features as beef meat, with 20% of proteins and 5% of fats, but swordfish flesh is rich in polyunsaturated fat. Rinse and dry the lavender leaves, then put them into a bag with grapeseed oil and then start the induced maturation© process for 60 minutes. After the process is over, you will have a lavender-flavoured oil which shows no signs of oxidation (thanks to a cold process) and has maintained all its nutritional and organoleptic properties. Take a 100-gram chop of swordfish and put it into a bag with the lavender-flavoured oil and sugar-and-salt solution and run induced maturation© for 120 minutes. 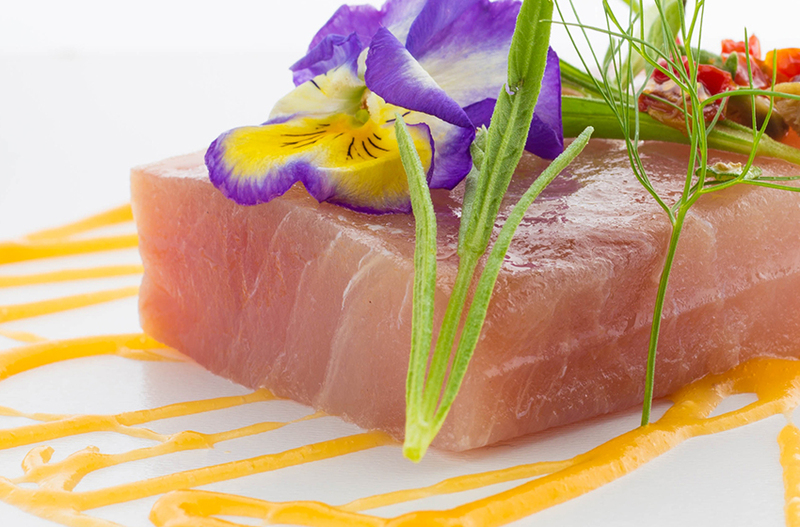 At the end of the process the swordfish is tender, as the induced maturation causes it to absorb marinade thoroughly adding a lavender hint to it, without disguising the flavour of fish. Peel the papaya, dice it up and remove the seeds: put it into a bag with alcohol, sucrose and water and run the induced maturation© process for about 30 minutes. Let it rest in the fridge for about 3 days in order to activate fermentation. When the process is complete, the fruit will have longer shelf life and all its organoleptic properties enhanced. The alcohol fermentation process can be considered as a chain reaction of chemical phenomena. During these processes, microorganisms (saccharomyces) are activated which decompose the glucose without oxygen, turning it into ethanol and carbon dioxide. Alcohol fermentation is essential for the formation of the aroma and taste of the food. Blend the fermented papaya and lay the mixture on a serving plate. Place the swordfish chop at the centre and garnish at will with candied tomatoes, capers and leaves of lavender. 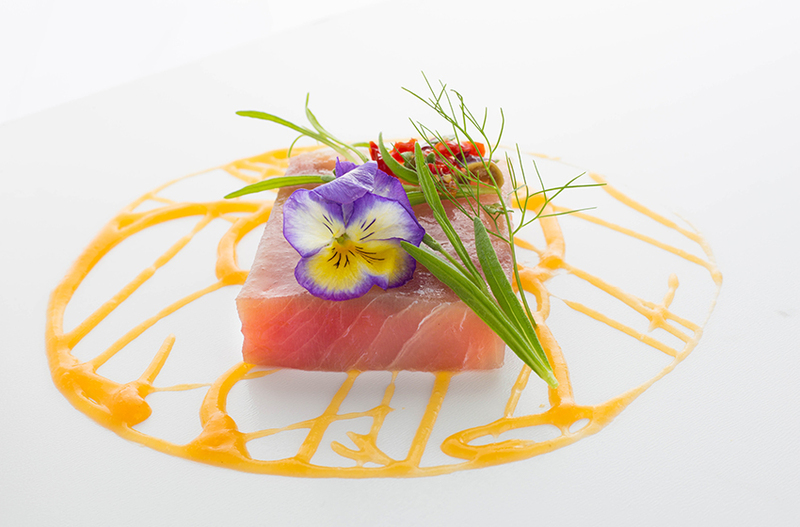 Thanks to induced maturation© we can thoroughly marinate fish in a short time to enhance shine and colour. Also, waveco® allows cold extraction and fermentation while ensuring food safety: all foods maintain their nutritional properties intact, have longer durability and unparalleled colour and taste, which would be impossible to obtain without it.